This innovative daily hand cream not only provides intense hydration but also helps restore skin's suppleness and prevent the appearance of brown spots. It combines Norwegian Formula moisture with active minerals, which help boost skin's own collagen production*. For visibly smoother and more supple skin. With a fast-absorbing texture that leaves a delicately scented and soft after-feel. 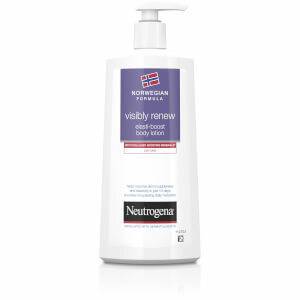 I have been using Neutrogena visibly renew hand cream for the last month and it is my new best friend! I suffer from dry hands, even worse after washing up, but this has improved them immensely. It's non greasy, covers well with just a small amount and is quick to absorb. The skin on my hands is plumper and well hydrated! A must for every woman's handbag, bedside table, or next to the sink! I am a mum of 2 and In dont have dishwasher so I obviously wash a lot of dishes and I'm also constantly washing my hands, so my hands take a lot of strain. 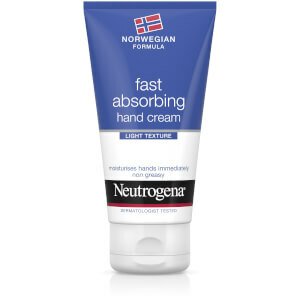 I have to put cream on my hands after each wash and the Neutrogena is one of the best I've used. It has helped to make my hands nice and soft and most importantly hydrated. I highly recommend this product! I work in a care home so I'm constantly washing my hands and wearing gloves which makes them very dry and quite sore. Since I got this hand cream, I haven't had any trouble with my hands at all! I no longer have dry and tight skin and the overall texture of my skin has improved dramatically. I use it everyday and I don't find it greasy or oily at all, in fact it is a lovely thick cream that sinks into my skin really quickly. It has a light fragrance that isn't overpowering. I'm so happy with this hand cream and will definitely be purchasing more in the future. This hand cream really dose what is saids. My husband and myself used it for 2 weeks. And you can tell a diffrence. It is not grease at all, plus you do not need much to rub in. I got to trial this neutrogena hand cream with spf 20, firstly I've not tried a hand cream with added spf in it. To be honest I've used better creams. The consistency of the cream was fine, I liked the packaging of the bottle. I suffer from terribly dry hands all year through, I handle unhygienic money at work as my day to day job, and also rough mail sacks therefore my hands suffer. I have also noticed how my hands have aged over the years. The fragrance of it wasn't particularly amazing, to be honest I expect a better fragrance from neutrogena. I couldn't see an improvement in the condition of my hands whilst I used it.I definitely wouldn't go out and purchase the cream. Wow! Finally a hand cream I love! I absolutely loved this hand cream from Neutrogena! The best thing about this product is how quickly it absorbs into the skin, leaving my hands soft and moisturiser without any greasy feeling. I keep my hand cream in my car and apply it each time I park - this has got me into a reliable routine of applying hand cream and what a difference it has made to my hands! Not only do my hands look smoother, the skin around my nails and my cuticles has also improved dramatically - lookilooking and feeling softer and healthier! The cream is easily dispensed from the tube and leaves a pleasant lingering fragrance on my hands. I can't recommend this cream enough! 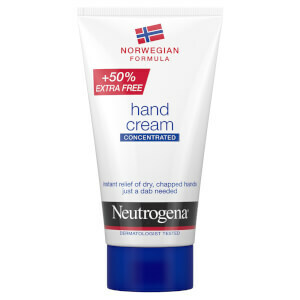 Love Norwegian formula hand cream! Been using this hand cream for the last couple of weeks, I have seen a complete difference in my hands!! !Working within construction my hands are rough and crack frequently. My hands actually are soft and cant remember the last time they were like this!